Russian nationalism, the Russian version of nationalism, promotes the celebration, appreciation and love for (ethnic) Russian culture and history, as well as Russian cultural identity and unity. Russian nationalism first rose in the early 19th and became closely related to pan-Slavism, from its origin during the Russian Empire to the Soviet era and beyond. The Millennium of Russia monument built in 1862 that celebrated one-thousand years of Russian history. The Slavophile movement became popular in 19th-century Russia. Slavophiles opposed influences of Western Europe in Russia and were determined to protect Russian culture and traditions. Aleksey Khomyakov, Ivan Kireyevsky, and Konstantin Aksakov are credited with co-founding the movement. Russian World War I era poster calling to buy war bonds. Pan-Slavism, an ideal of unity of all Slavic Orthodox Christian nations, gained popularity in the mid- to late 19th century. Among its major ideologists were Nikolay Danilevsky. Pan-Slavism was fueled by and was the fuel for Russia's numerous wars against the Ottoman Empire with the goal of liberating Orthodox nations, such as Bulgarians, Romanians, Serbs and Greeks, from Muslim rule. The final goal was Constantinople; the Russian Empire still considered itself the "Third Rome" and saw its duty as conquering the "Second Rome". Pan-Slavism also played a key role in Russia's entry into World War I, since the 1914 war against Serbia by Austria-Hungary triggered Russia's response. In the closing years of the 19th century, Russia was trying to catch up with Western Europe's Industrial Revolution. The already large gap between the wealth of the rich elite and that of the poor had grown, causing patriotic enthusiasm to decline. Revolutionary activities intensified, culminating in the 1905 Russian Revolution. The revolution led to the emergence of new nationalist and rightist organizations and parties such as the Russian Assembly, the Union of the Russian People, the Union of Archangel Michael and others. Their motto was "Russia for Russians". These parties remained monarchist and anti-Semitic; they were organised by wealthy, powerful aristocrats such as Vladimir Purishkevich and Nikolai Yevgenyevich Markov. World War I revived the national spirit and enthusiasm. However, as the war effort on the eastern front failed, the popularity of Nicholas II declined to the level extant when he abdicated during the February Revolution. After the subsequent October Revolution, which resulted in the overthrow of the Russian Provisional Government and the Russian Civil War, the loosely allied monarchist and anti-communist White Army continued to promote Russian nationalism until they were defeated by the Red Army. The Bolshevik revolutionaries who seized power in 1917 were nominally "antinationalists" and "antipatriots". The newborn Soviet republic under Vladimir Lenin proclaimed internationalism as its official ideology using the Russian language—which was also the language of their party and government. Since Russian patriotism served as a legitimizing prop of old order, Bolshevik leaders were anxious to suppress its manifestations and ensure its eventual extinction. They officially discouraged Russian nationalism and remnants of Imperial patriotism, such as the wearing of military awards received before Civil War. Some their followers were unlike minded; in non-Russian territories Bolshevik power was often regarded as renewed Russian imperialism during 1919 to 1921. After 1923 a policy of nativization, which provided government support for non-Russian culture and languages within the non-Russian republics, was adopted. Romantic Russian nationalist themes appeared in art, such as the historical epic films by Sergei Eisenstein and Vsevolod Pudovkin, as well as Sergei Sergeyev-Tsensky's patriotic novels. The Russian people did not achieve their ancient dream of Moscow, the Third Rome. The ecclesiastical schism of the 17th century revealed that the muscovite tsardom is not the third Rome. The messianic idea of the Russian people assumed either an apocalyptic form or a revolutionary; and then there occurred an amazing event in the destiny of the Russian people. Instead of the Third Rome in Russia, the Third International was achieved, and many of the features of the Third Rome pass over to the Third International. The Third International is also a Holy Empire, and it also is founded on an Orthodox faith. The Third International is not international, but a Russian national idea. The Soviet Union's war against Nazi Germany became known as the Great Patriotic War, recalling the previous use of the term in the Napoleonic Wars, the Patriotic War. The Soviet state called for its citizens to defend the "Motherland"; Stalin proclaimed the slogan "Not a step back!". At the same time, Nazi Germany organised collaborationist military units such as Andrey Vlasov's Russian Liberation Army and Pyotr Krasnov's Cossacks. During the Second World War, the strong patriotism of Vlasov's army presented Russians with an alternative to the state-centered nationalism promoted by the Stalin's government. In 1944, the Soviet Union abandoned its communist anthem The Internationale and adopted new national anthem. The Romanov flag is used by some Russian nationalists and monarchists. A march of about 7,000 people waving Czarist flags, chanting anti-immigrant slogans and carrying a big banner that reads "Let's give back Russia to Russians" (Вернём Руссию русским) in Moscow, November 4, 2011. After the dissolution of the Soviet Union, the Russian Orthodox Church restored much of its Tsarist-Russian influence on the society. The church became a common source of Russian pride and nationalism. The official ideology did not completely turn to Imperial monarchist sentiment but tried to maintain a balance between Tsarist and Soviet ideals. The ruling United Russia party said its view of Russia is that of a multi-national republic and calls for national tolerance one of its key platforms. Vladimir Putin's government is also using natalist policies by giving rewards and promoting more children in families. Many nationalist movements, both radical and moderate, have arisen in modern Russia. One of the oldest and most popular is Vladimir Zhirinovsky's right-wing populist LDPR, which had been a member of the State Duma since its creation in 1993. Rodina was a popular moderate left-wing nationalist party under Dmitry Rogozin, which eventually abandoned its nationalist ideology and merged with the larger socialist party A Just Russia. One of the more radical, ultranationalist movements is Russian National Unity, a far-right group that organises paramilitary brigades of its younger members. Others include BORN (Militant Organization of Russian Nationalists) which was involved in the murder of Stanislav Markelov, the neo-monarchist Pamyat, the Union of Orthodox Banner-Bearers, and the Movement Against Illegal Immigration, which revived the slogan "Russia for Russians" and usually attract young skinheads. These parties organise an annual rally called the Russian March. A rise of radical nationalism in modern Russia is considered to be a result of several factors; the humiliation felt after the fall of the Soviet Union; a response to the activity of ethnic criminal groups from the South Caucasus and Central Asia and ongoing illegal immigration from these regions; and a reaction to modern, Russian-enforced national tolerance. It is also alleged that the FSB is selectively using nationalist extremism to drive sentiments in the society in desired direction. In modern Russia, the term националист (Russian pronunciation: [nətsɨənɐˈlʲist]) or "nationalist" bears the negative connotation of far-right nationalists and neo-fascists, rather than in the word's original meaning. Some parties like United Russia use the word as a pejorative synonymous with chauvinism regarding their right-wing opponents. The financial crisis starting 2008-2009 saw the anti-immigration sentiment become more accepted in Russia because of an increased concern that immigrants—particularly illegals—would compete for jobs with the domestic workforce, and if not getting jobs, would turn to crime. Outside Russia, with the fall of Soviet ideology of enforced internationalism, national clashes among the ethnic groups within its former borders erupted. Because of repressive Soviet occupation politics and the privileged status of Russians in Soviet society, some post-Soviet states rejected all things Russian and Soviet as a symbols of occupation, and particularly in the Baltic states and Georgia, with some embracing anti-Russian sentiment. Following the 2014 Russian military intervention in Ukraine, United Russia has increasingly relied on Russian nationalism for support. Politicians like Vladimir Zhirinovsky started building their narrative on categorically denying Ukrainian ethnos. At the same time, the ruling party cultivated close ties with Eurosceptic, far-right and far-left political movements, supporting them financially and inviting them to Eurasian conferences in Crimea and Saint Petersburg. In March 2015, the Russian nationalist party Rodina organized the International Russian Conservative Forum in Saint Petersburg, inviting a majority of its far-left and far-right (including openly neo-Nazi) supporters from abroad, many of whom had visited a similar event in Crimea in 2014: Udo Voigt, Jim Dowson, Nick Griffin, Jared Taylor, Roberto Fiore, Georgios Epitidios (Golden Dawn) and others. Extremist nationalism in Russia refers to many far-right and a few far-left ultra-nationalist movements and organizations. Of note, the term nationalism in Russia often refers to extremist nationalism. However, it is often mixed up with "fascism" in Russia. While this terminology does not exactly match the formal definitions of fascism, the common denominator is chauvinism. In all other respects the positions vary over a wide spectrum. Some movements hold a political position that the state must be an instrument of nationalism (such as the National Bolshevik Party, headed by Eduard Limonov), while others (for example, Russian National Unity) resolve to vigilante tactics against the perceived "enemies of Russia" without going into politics. Historically, the first prototype of such groups started with the Black Hundreds in Imperial Russia. More recent antisemitic, supremacist and neo-fascist organizations include Pamyat, Russian National Socialist Party and others. In 1997, the Moscow Anti-Fascist Center estimated there were 40 (nationalist) extremist groups operating in Russia. The same source reported 35 extremist newspapers, the largest among these being Zavtra. In spite of repression by governmental authorities, a far-right extremist movement has established itself in Russia. ^ "O. I. Senkovskii and Romantic Empire" (PDF). ^ 2001: Perry Anderson, Professor of History and Sociology, UCLA; Editor, New Left Review: Internationalism: Metamorphoses of a Meaning. See also the interview with Anderson. ^ Timo Vihavainen: Nationalism and Internationalism. How did the Bolsheviks Cope with National Sentiments? in Chulos & Piirainen 2000. ^ "isbn:5457554619 - Google Search". books.google.com. ^ Cathrine Andreyev, Vlasov and the Russian Liberation Movement: Soviet reality and emigre theories. Cambridge University Press, 1987. ^ "Leader of "Kremlin project" found guilty of ultranationalist BORN murders :: khpg.org". khpg.org. Retrieved 2015-07-17. ^ "Влади Антоневич и его фильм "Кредит на убийство"". ИноСМИ. Retrieved 2015-09-12. ^ "Russia: Western Businesses and the Return of the Cold War Mentality". Stratfor. Retrieved 2015-09-12. ^ Van Herpen, Marcel H. (27 February 2014). Putin's Wars: The Rise of Russia's New Imperialism. Rowman & Littlefield Publishers. p. 296 pp. ISBN 1442231378. ^ Echols, William. "Fiery Russian Nationalist Politico Denies Ukraine History". POLYGRAPH.info. Retrieved 2018-11-11. ^ a b Max Seddon (2015-03-22). "Racists, Neo-Nazis, Far Right Flock to Russia for Joint Conference". BuzzFeed. Retrieved 2015-03-23. ^ "Chronology of events - NUPI". Archived from the original on 2007-09-30. The Faces of Contemporary Russian Nationalism. Princeton University Press, 1983. Verkhovsky, Alexander (December 2000). "Ultra-nationalists in Russia at the onset of Putin's rule". Nationalities Papers. 28 (4): 707–722. doi:10.1080/00905990020009692. Russian: Г. Кожевникова Радикальный национализм в России: проявления и противодействие Центр экстремальной журналистики. 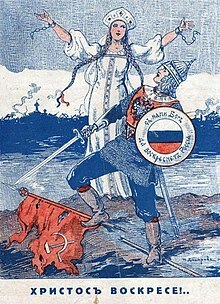 Wikimedia Commons has media related to Russian nationalism.